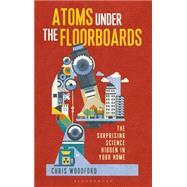 Using the modern home as a springboard, Atoms Under the Floorboards presents the fascinating and surprising scientific explanations behind a variety of common (and often entertainingly mundane) household phenomena, from gurgling drains and squeaky floorboards to rubbery custard and shiny shoes. Packed with facts and fun, each chapter focuses on the objects and processes familiar in everyday life and slowly unpicks the science behind them. For example, the chapter on how buildings work introduces static and dynamic forces in explaining why buildings (and their foundations) don’t sink into the ground and why skyscrapers don’t blow over in strong winds. The chapter on bicycles explores how "a couple of more or less empty circles (better known as wheels) with a few flimsy bits of metal (spokes) stretched between them" are able to support your weight--and this leads into a discussion of compression, tension, and how gears work. After reading Atoms Under the Floorboards, you’ll never look at everyday objects the same way again. Chris Woodford has been a science and technology writer for twenty-five years. After graduating from Cambridge University with a degree in natural sciences, he has gone on to write, co-write and edit a number of science education books, including the bestselling Cool Stuff series. His website www.explainthatstuff.com is dedicated to explaining the science behind familiar, everyday things. He lives in Dorset, UK.